Rock For Europe, Sep 22nd 2018 (jpg)10 hours of music, speakers, and fun. It's a pro Europe event to demonstrate the positive aspects of European Union membership, the music industry, stalls, and more. Promoted in association with Chester for Europe, to support The People's Vote. 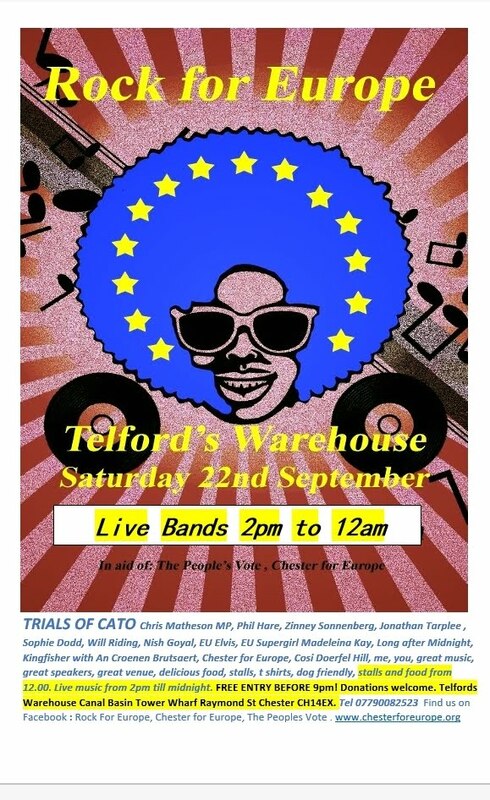 Telfords Warehouse, Raymond Street, Chester, Sep 22nd 2018 2pm to midnight.. Free entry before 9pm. Arrive early as we expect to be busy ! Featuring Trials of Cato, Phil Hare, Long After Midnight, The Number 10 Vigil ( Faux Bojo, EU Elvis, EU Supergirl and citizen of the year Madeleina Kay ), Kingfisher ( with members of Time Bandits, Full House, Galleon Blast), Will Riding, Jon Tarplee, Sophie Dodd, Sonnenberg, Cosi Doerfel Hill, Chris Mattheson MP., face painting, t shirts.